The author of this op-ed, Michaelle Pearson, states that there is strong evidence that Sound View is the oldest public beach in the country. 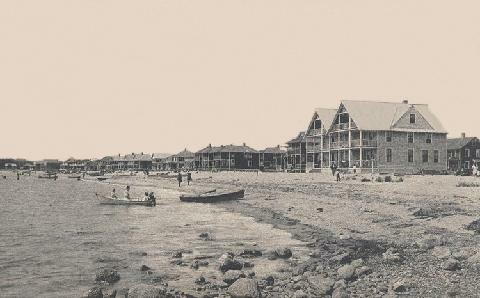 The image above shows the beach circa 1920. COMMENTS ON THIS ARTICLE ARE NOW CLOSED: Sound View residents have been receiving letters from Heidi DiNino-Fields of Hartford Avenue urging them to register their opposition to the Sound View Historic District designation. These letters are filled with incorrect information, designed to confuse and frighten residents into opposition. Among the more blatant lies are that owners would not be able to paint or maintain their property; that it would negatively affect insurance, taxes and marketability; that it would impede upgrading to FEMA standards, and that the property “will essentially be frozen in as-is condition.” Each of these is completely false. The National Historic Register is simply an Honorary designation to recognize neighborhoods that have a unique character and history. There are absolutely no restrictions on owners’ ability to renovate or develop their properties. This designation is different from the Town Historic District, on Lyme Street, which is overseen by the Historic District Commission, and has nothing to do with Sound View, or this type of designation. Having a property within the Sound View Historic District actually conveys many benefits on owners, including better rates on insurance, better marketability, and assistance with waivers to FEMA requirements, building and zoning. The designation’s purpose is to make it easier for owners to renovate and develop their properties, if that is their choice. If an owner wants to renovate their property in a non-historic manner, or not at all, that is their choice. There is no government entity that can or will tell them what they can or can’t do. IF an owner chooses to renovate in a historic manner, they become eligible for grant programs and tax abatements up to $30,000. If the owner wants the tax credit, that particular work will be subject to review, but only to ensure that the money is going toward a historic renovation. If an owner doesn’t take the cash, they can do whatever they like. No review or oversight whatsoever. Historic District designation has no impact on property taxes. Sound View’s rich history has been obscured for too long by its rowdy reputation from the 1950s-1990s. As an intact pre-1938 beach community, Sound View is a unique and rare coastal resource. It was developed in the early 1890s, and there is very good evidence that it is the nation’s oldest public beach. Many of the cottages have been passed down for generations within the same families, and are maintained with pride to this day. The Historic District designation honors this tradition, and will help to preserve the neighborhood and public beach for future generations. This is a valuable opportunity for our town. Let’s not let one uninformed naysayer scare people into opting out of this positive opportunity. Old Lyme Historical Society Co-President Mark Lander, dressed in period costume, reads during the ‘Light Up the Night’ celebrations Tuesday evening. Photos by Michaelle Pearson. REVISED 4/9/14: At 7.30 p.m. on Tuesday April 8, a goodly crowd gathered at the edge of the Connecticut River in Old Lyme to commemorate the bicentennial of the 1814 British raid on Essex. A cannon on the boardwalk serves as a reminder of the times of yesteryear. “Light Up the Night” began with a drummer, who called the crowd to attention. Then the bonfire was lit and cannons fired as Mark Lander of the Old Lyme Historical Society read a narrative of the historic events. Members of the Old Lyme Fire Department help keep the bonfire under control. Two hundred years ago to the day, the British Navy quietly slipped into the town of Essex (then called Pettipaug), looted it of arms and supplies and set fire to 27 American vessels before taking advantage of the swiftly running current to escape downriver to the Long Island Sound. Along the shore, the citizens lit bonfires in an attempt to illuminate the river so cannons could be aimed at the departing British. The event was one of a series of activities coordinated by the 1814 Bicentennial Committee. Bonfires also took place at Gardiner’s Landing in Old Saybrook and on the water-side green at the Connecticut River Museum in Essex. Mark Lander continues his reading. Old Lyme Historical Society Co-President Mark Lander related how the British Squadron blockading the Sound targeted River privateers and merchant shipping for destruction in a daring nighttime raid on an undefended and unprepared citizenry. This evocative event was intended to inspire area residents to imagine the emotions of fear, frustration, and desperation experienced by the people who lived here in 1814. “Light Up the Night” was sponsored by the Connecticut River Museum, and the Historical Societies of Old Lyme, Old Saybrook and Essex.